Cliff Head production at 75,327 bbls at an average production rate of 819 bopd: Cliff Head production fell due to field downtime as a result of the program to replace a section of the onshore water injection and crude oil pipeline. The average received oil price for the quarter was US$60.26 per barrel and lifting costs increased to US$38.21 from US$30.56 compared to the previous quarter which was mainly due to the lower production number. Xanadu program is finally moving forward: We have been disappointed with the progress that has been made in appraising the Xanadu discovery considering the material value uplift that Xanadu represents for each of the JV partners. The planned shallow water seismic program is close to being finalised, and the operator has announced that they intend to re-enter the well in the fourth quarter of this calendar year. We value TEG on our base case assumptions at $0.31 a share and maintain our Buy recommendation. This assumes a low case outcome for Xanadu but does assume an upgrade to current the Cliff Head infield reserves of 3m bbls of oil. It is clear from the accompanying chart that the market is undervaluing TEG and in effect ignoring the value of State Gas, the current Cliff Head upgrade program and any value for the Xanadu discovery. 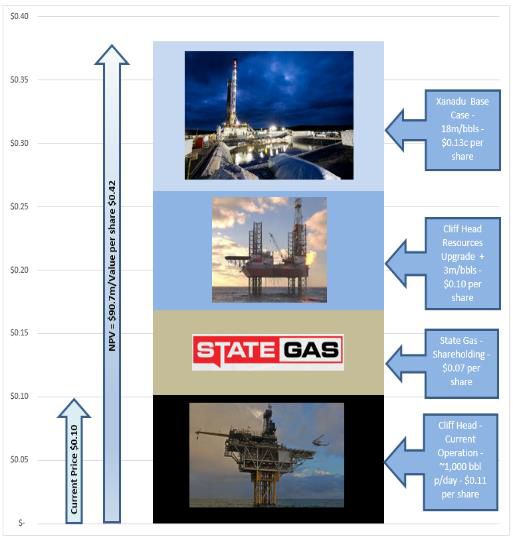 The current market pricing seems to assume that these programs will not deliver any value to the business which in our view is an unlikely outcome given the state of the oil market and the quality of the underlying assets. DJ Carmichael Pty Limited, members of the Research Team; including authors of this report, its directors and employees advise that they may hold securities, may have an interest in and/or earn brokerage and other benefits or advantages, either directly or indirectly from client transactions in stocks mentioned in this report. DJ Carmichael Pty Limited and or its employees hold an immaterial holding in Triangle Energy Limited. DJ Carmichael Pty Ltd acts as Corporate Adviser to Triangle Energy Limited. The Analyst owns shares in Triangle Energy Limited. In accordance with Section 949A of the Corporations Act 2001 DJ Carmichael Pty Limited advises this document contains general financial advice only. In preparing this document DJ Carmichael Pty Limited did not take into account the investment objectives, financial situation and particular needs (‘financial circumstances’) of any particular person. Accordingly, before acting on any advice contained in this document, you should assess whether the advice is appropriate in light of your own financial circumstances or contact your DJ Carmichael Pty Limited adviser. DJ Carmichael Pty Limited, its Directors employees and advisers may earn brokerage or commission from any transactions undertaken on your behalf as a result of acting upon this information. DJ Carmichael Pty Limited, its directors and employees advise that they may hold securities, may have an interest in and/or earn brokerage and other benefits or advantages, either directly or indirectly, from client transactions. DJ Carmichael Pty Limited believes that the advice herein is accurate, however no warranty of accuracy or reliability is given in relation to any advice or information contained in this publication and no responsibility for any loss or damage whatsoever arising in any way for any representation, act or omission, whether express or implied (including responsibility to any persons by reason of negligence), is accepted by DJ Carmichael Pty Limited or any officer, agent or employee of DJ Carmichael Pty Limited. This document is intended only for the use of the individual or entity to which it is addressed and may contain information that is privileged, confidential and exempt from disclosure under applicable law. If you are not the intended recipient or employee or agent responsible for delivering the message to the intended recipient, you are hereby notified that any dissemination, distribution or copying of this communication and its attachments is strictly prohibited. The Author of this report made contact with Triangle Energy Limited for assistance with verification of facts, admittance to business sites, access to industry/company information. No inducements have been offered or accepted by the company.